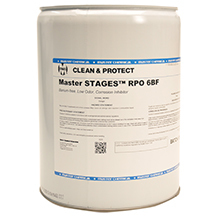 Master STAGES™ RPO 6BF is a barium-free, nonstaining, water displacing, thin-film corrosion inhibitor or rust preventative which can be used on a variety of metals. RPO 6BF provides indoor corrosion inhibition, excellent protection for bearings and other precision parts, in-process parts in storage, as well as parts in transit. Easily removed with detergent cleaners, such as Master STAGES™ CLEAN 2029 "One Step"